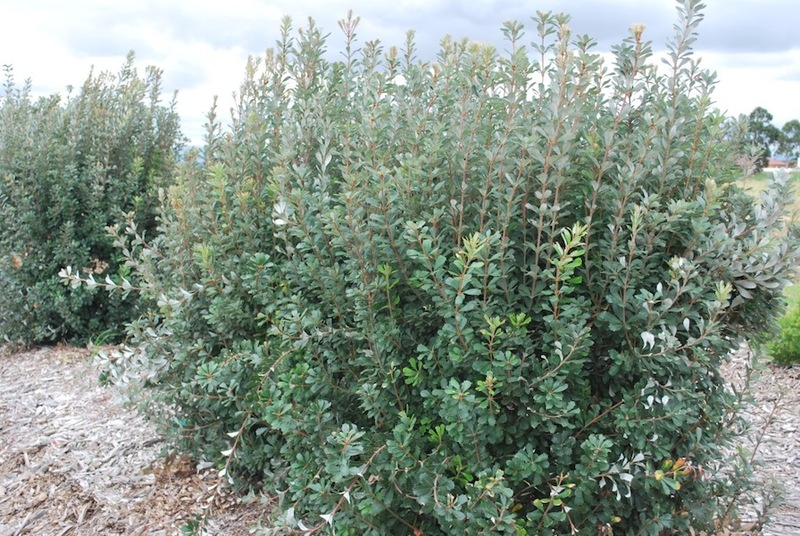 Four new Australian plants – Leptospermum ‘Lemon, Lime n Bitters’, Banksia ‘Sentinel’, and Westringia ‘Aussie Box’ and ‘Grey Box’ are interesting new cultivars that are all dwarf forms of their parent plants, making them ideal for smaller gardens, pots and narrow spaces. I talk with horticulturist Sabina Fielding Smith about the growth habits and cultivation of these shrubs. Leptospermum petersonii or lemon-scented tea tree, were called tea trees as early Australian settlers used to boil up the strongly lemon-scented leaves to make a kind of tea which was also high in Vitamin C, protecting them from scurvy. It grows to about 4m high, and has narrow light green, aromatic leaves and bee-attracting white flowers. Leptospermum ‘Lemon Lime n Bitters’ from Austraflora is a smaller selection than the parent plant, growing to only 0.5m x 0.5m. A standout feature is its multi-coloured new growth in pink, orangey-green and red, followed by the white flowers in spring to summer. You could use it for a low, mounding shrub, a dwarf hedge or a foliage contrast plant. Listen while Sabina and I discuss this interesting new plant. Curiously named after Westring, a botanist who studied lichens, Westringia, or coast rosemary, is a very tough, drought tolerant plant, resistant to both salt-laden winds and frost. 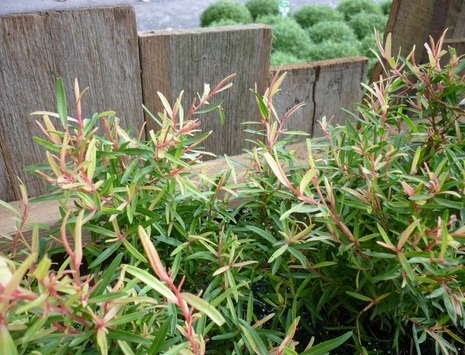 Westringia respond very well to frequent light pruning and make an excellent clipped hedge. They have white, tubular flowers that are buzz pollinated by native bees. There are two new varieties for Australian gardens from Ozbreed. Westringia ‘Aussie Box’ is a new compact form growing naturally into a natural ball shape to about 60cm. Westringia ‘Grey Box’ is even more compact, growing to only 30-40cm high and prunable to only 20cm high if you want. Find out about the growing conditions for these great plants. Australia has over 170 species of Banksia, including coastal banksia, or Banksia integrifolia, the east-coast native parent plant of the new Banksia integrifolia fastigiata ‘Sentinel’ from Austraflora. 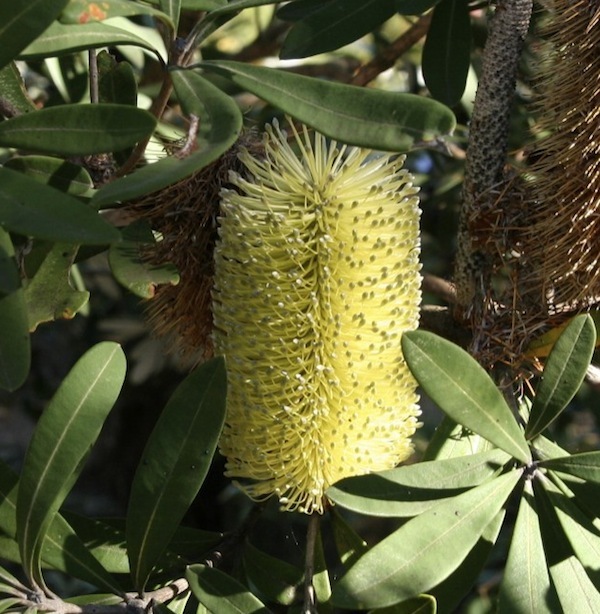 Banksia integrifolia can tolerate harsh conditions including front line coastal. They have compound limey-yellow flowers, which are very attractive to nectar-eating birds and small mammals like sugar gliders and pygmy possums. The new ‘Sentinel’ is a narrow, upright form to 2m high, with smaller leaves and useful for restricted spaces, and featuring yellow-flower spikes through late summer to autumn. Listen to find out more about growing this new cultivar. TIP: Banksia integrifolia flowers occur on two year old wood. So note down when you pruned your plant, otherwise you might end up missing out on flowers for years and be wondering why. Like this post? Why not share it with a friend? Thanks Marianne. Love banksias and would dearly love some here but clay soil doesn’t seem to like them, or I should say, they don’t like it. Is there a variety that wd be a bit forgiving? The leptospernum lemon lime and bitters is a pretty little bush; so taken with the pinky new growth ….. would be lovely lining a pathway, I think. Tea trees are generally hardy and will grow in any soil, even soils, even those that are inundated for a while.Can even say that they will withstand neglect for some time and will grow in clay soils that have moderate drainage. Frost tender when young. Leptospermum Lemon Lime and Bitters will tolerate the same type of conditions as the parent plant, Lemon Scented Tea Tree, or L. petersonii. so the actual variety name of the Westringia is Grey Box is it? Banksia marginata is fine on clay soil, as long as it drains. I have clay and am growing 5, all doing well. I am growing Banksia sentinel too, and it seems fine. 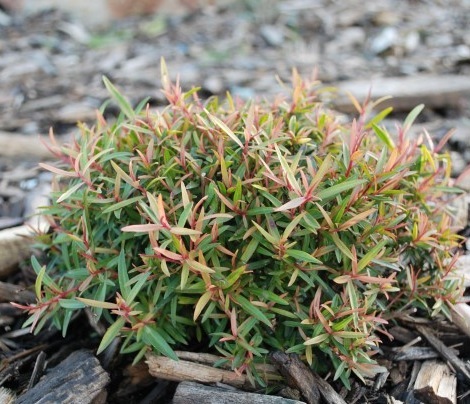 Aussie Box is a trademark name for Westringia ‘WES02’ for which Ozbreed holds the PBR. Similarly Grey Box is the trademark name for Westringia fruticosa ‘WES04, also an Ozbreed PBR. Grey box is also used as a common name for several different eucalypt species, such as Eucalyptus microcarpa and also Eucalyptus punctata. What's your garden issue or question? how do I open my garden?